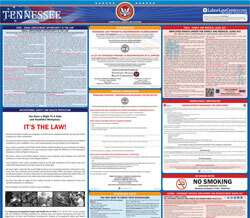 The Tennessee Workers' Compensation Insurance Posting Notice (Spanish) is a workers compensation law poster by the Tennessee Department Of Labor and Workforce Development. This is a mandatory posting for all employers in Tennessee, and businesses who fail to comply may be subject to fines or sanctions. This poster, written in Spanish, must be posted in a conspicuous place by all employers so that all Spanish speaking employees can see it. This poster describes what employers must have workers' compensation insurance, what employees should do if injured in the workplace, and what an employer should do when an injury is reported. It appears you don't have a PDF plugin for this browser. Please see the link below to download tennessee-wc-certificate-sp.pdf. La ley de 	Compensación a Trabajadores	 exige que se publique este aviso en un lugar visible en el centro de trabajo en todo momento. ¿Qué se debe hacer en caso de lesión laboral?